Production on Todd Phillips' Joker movie has officially wrapped. To celebrate, Joaquin Phoenix posed for photographers in full costume and makeup while smoking a cigarette. The movie has been filming in New York City for the last three months and there have been more than a few set photos that have found their way online. Actually, it seems that almost every day on the set was documented by the paparazzi and New York City residents, who welcomed Phoenix's Clown Prince of Crime into their city with open arms. In addition to the shots ofJoaquin Phoenix as the Joker, there were also images of him and Zazie Beetz working together when he was in his normal Arthur Fleck wardrobe. Over the weekend there were shots and video of the actor running through the streets in full makeup as well. What's impressive about the project is that even though there have been picture leaks nearly every day, nothing substantial about the story has been given away, leaving DC fans wondering what Todd Phillips and Phoenix have created. At this point in time, we know that the Joker movie takes place in the early 1980s as Arthur Fleck hits some hard times. The recently released synopsis promises that the movie is a completely original tale that has never been seen on the big screen before. Joaquin Phoenix has said more than once that it's a character study and that it will be much different than what DC fans are expecting. The synopsis ends by calling the upcoming movie a "cautionary tale," which is something that Todd Phillips has said before as well. Todd Phillips' Joker movie exists outside of the DCEU, so the director and Joaquin Phoenix were more than likely offered a substantial amount of creative freedom while creating the movie. Currently, DC Comics fans are getting a little sick of seeing the same characters, like Batman, Superman, Joker, etc. on the big screen, but it looks like the upcoming movie is going to deliver something completely different that will be a fresh take on the iconic villain. While fans were originally skeptical of Joaquin Phoenix taking on the role, most of them changed their tune when they saw the actor in full makeup. 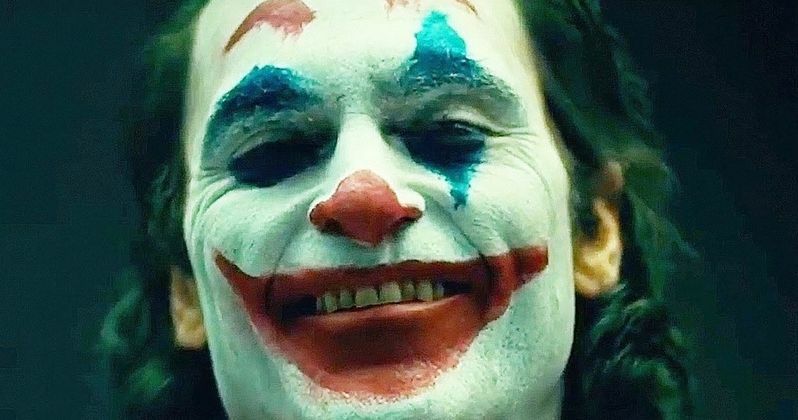 While we still haven't seen any official footage from the Joker movie, it looks like Joaquin Phoenix's version of the Clown Prince of Crime will be quietly intense, as opposed to over the top like we've seen in the past. With that being said, it's entirely too early to tell what the movie will end up as or what Phoenix's performance will be like. Thankfully, we won't have to wait too much longer to see. The Joker movie is scheduled to hit theaters on October 5th, 2019. While we wait for the first trailer, you can check out Joaquin Phoenix waving goodbye as production wraps below, thanks to the Joaquin Phoenix Brasil Twitter.